Kettlebell Hell is paved by fitness buying intentions. Hola gang! Today we see what's best to buy the in the realm of adjustable kettle bells. Not to sound like an old timer, aka your grandpa, but back when I was trying to buy a kettlebell there were not too may choices. You now are over loaded with a gambit of adjustable kettlebells. I have said before: choose for the workout goals you are working towards. 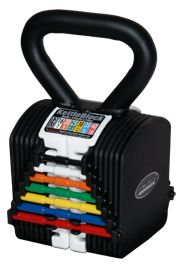 Weight range using QLDB standard locking screws: 22.5 - 57.5 lbs. Adjustable in 2.5 lb increments. Bell shape is Cubed also but it has an beveled top which could make for a good bell for most exercise in the Kettlebell routine. Another perk is if you already have or are planing to buy dumbbells and a barbells set you can interchange the weights ; another space saver. $99 For the base handle to $209 for handle and additional weights. Hey gym rats we last spoke about conserving space and some money. Kettlebells are a great why to do so. But only if you buy the right set for your fitness goals. Kettle bells like dumbbells are versatile in their use and ranges of weight. We today can buy them in set of 5lbs and as heavy as 200lbs. There are adjustable versions that can cover 5 lbs to 35 lbs which are great for those of us who have limited space and need slight raising or lowering of weights as needed. I currently employ 2 adjustable kettlebells; the first set range is 9 lbs -25 lbs and the second set 35lbs to 70.5 lbs . My purchase of $250 instead of $780. So I guess what I'm saying is 2 adjustable kettlebells and better than 13 kettlebells at least in conservation of space in you wallet . You fit goals dictates your dumbbell purchase. When I started to thinking about buying dumbbells I had cost, storage space and ease of use- aka adjusting from one exercise and relating weight for said exercise, in mind. With a twist on each bell, on both sides, the dial of the weight choices is fast and my heart rate drops very little if any. Now if your goal is to lift very heavy to failure you will need to purchase dumbbells that can withstand being possibly dropped and/or treated roughly. I would still buy the adjustable for when you cycle to lower weight training but then buy some heavy weight rubberized; this will protect you and your floors when you could drop it on the failure rep. It was mentioned earlier in the post about core training with dumbbells. It is usually done with lower to medium heavy weight for endurance reps and sets aka 20 reps 3-4 sets. example: renegade row side plank with dumbbell tuck. If your workout includes balancing on the weight then you may need to purchase very sturdy dumbbells in the weight range you can use to perform the workout. Adjustable dumbbells are still my favorite type of weights for general fitness until you progress to more fitness goal specific, at which time you may need to expand to a few more rugged type of weights. Hey we have all been there, trying to get back into or starting a fitness journey. Well the dumbbell is one of the most versatile, but also costly pieces of gear you can buy. You could try for an entire dumbbell rack that could cost you thousands of dollars and limit your workout space- or consider some of my ideas that have been cost effective and great space savers.